The Warmblood Breeders Studbook held their 2018 Stallion Grading at Moreton Morrell College Warwickshire on 30th September. The judges were Hans-Heinrich Bruning and Katy Holder-Vale. Hans and Katy had 6 stallions to assess on the day over three stages. Firstly the stallions are seen on level ground to check correctness in the limbs, secondly they are seen in hand at walk and trot then released to show their loose gaits at trot and canter, they are then loose jumped to check the stallion’s athleticism. All the stallions performed well and for the first time ever at a WBS-UK grading all the animals presented were licenced. This is a good indication that British breeders are now aware of the importance of the quality needed for a stallion to become licenced and for him being capable of producing offspring who will hopefully go on and be successful in their chosen careers. Woodlander Grand Design (Hann) came out on top and was awarded the champion stallion sash. He is sired by the KWPN stallion Grand Galaxy Win and is out of Foxy Lady by Florencio. Grand Design scored an eight for overall general impression making him a premium stallion. 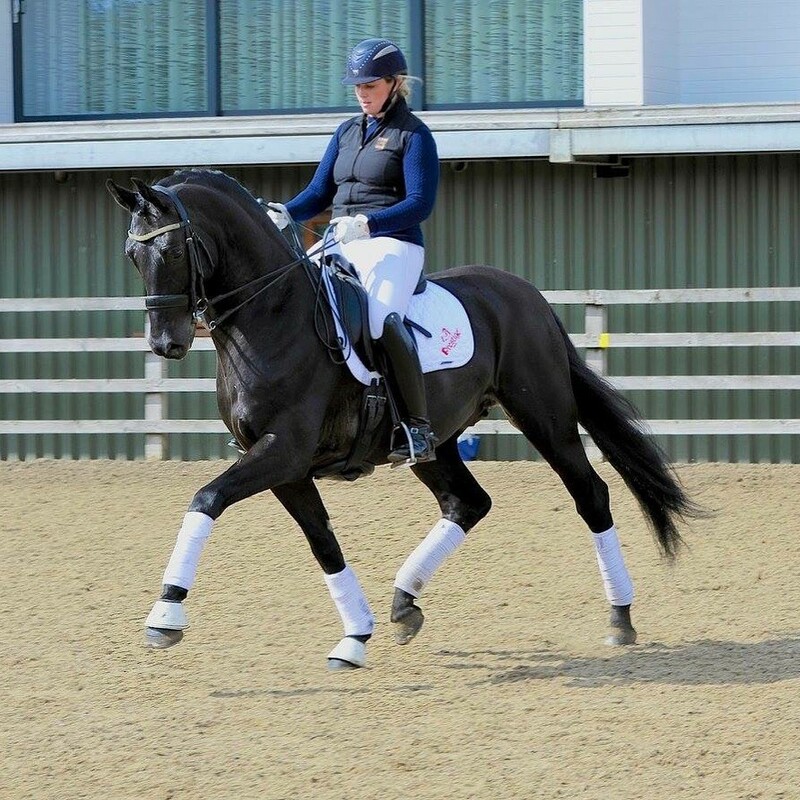 Bred by the Woodlander Stud and is owned by Sylvia Tainton from Worcestershire, The judges liked his athleticism, active paces and attitude, his immediate future is to stand at stud next season but will be ultimately destined for a dressage career. Furst Romeo (Old) sired by Furst William and out of Davinia by Don Davidoff became the reserve champion stallion, he is owned and bred by Caroline Cooper from the Bayfield stud in Surrey. Furst Romeo scored particularly well for movement with a nine for his trot, he was commended for his type and elastic paces. Lollipop by the dressage stallion Uthopia out of Gallia by Amoureux is a KWPN registered stallion owned by Elizabeth Ball from Chicheley in Bucks. Liz bought the dam with Lollipop in utereu from the breeder Lisa Macintyre. The judges described him as an elegant modern type with good attitude. Ultimatum (BHHS) is another sired by Uthopia and is out of Waldfee by Worldchamp, he is owned and bred by Mike Smith from Romey.Ultimatum was athletic when jumping and scored the highest jumping marks of the day. Downton (BWBS) is well bred for dressage by Larkshill Debonair out of Ratina by Regazzoni, owned and bred by Mr and Mrs Johnson from Keniworth. This stallion scored a nine for his excellent walk. Florin of Westoak (BHHS) bred by Sue Simmons and owned by Molly Shields from Chesterfield is by Flammengold out of Diva by Dimaggio. The judges thought he had a lot more maturing to come, but he has good paces and a beautiful temperament. Fantasie by Flammengold out of the TB mare Sovereign Star, was ill on the day and unfortunately could not be presented, but as he had previously been seen by the judges and highly rated it was decided to award him temporary covering permission for next season pending re-examination at the next stallion grading. We are delighted to announce that also joining the studbook by special invitation is Franz Ferdinand who is full brother to double world champion Woodlander Farouche and himself top Futurity sire last year. Saturday & Sunday 29th & 30th September - Moreton Morrell College : Warks. Check out our new stallions for 2018, these include newly licenced Romanno Danteno, Woodlander Wild Love, Myspires Fider Hit, Silver Don, Volatis Defiant and Godrics Decoy. After the sad loss of Rubin Star N, Jennie Gilchrist has acquired a new stallion in L'Espoir who was Champion stallion at the 2009 Danish Warmblood Grading. New pony stallions include the Elite Top Yellow, international dressage pony, Photos and information can be found in our stallion list. Leicestershire. Entry Forms now available. PLEASE SEE FACEBOOK PAGE FOR STALLION GRADING ENTRIES AND TIMES. Saturday / Sunday 10th and 11th September. both ponies and horses to add to our list of approved stallions for 2016. Katy Holder-Vale at Onley Grounds, Rugby, on Sunday 18th October. 6 stallions came forward to be assessed and of these 5 were licenced. Champion stallion was Silver Lining ZB who is a son Supertramp. Bred by Lynne Crowden and now owned by Lynne and Carsen Sandrock, this impressive stallion immediately caught the eye, the judges really liked his modern type, presence and masculinity with good movement. Reserve Champion was Kracka. Imported and produced by Denise Mitchell, he is now owned by Margaret Stuart . The judges thought all his gaits were really impressive, scoring a 9 for his trot, he is also very supple through the body. Although a little small at the moment this did not detract from his overall impression. St. Louis Blues. A slightly heavier type but very harmonious with 3 good gaits. Diamond Cut. A very athletic, supple horse with great dressage potential. Balthazar. A son of the champion graded stallion Boston, a nice modern type with very good walk. Owner: L. Crowden & C Sandrock. Breeder: L. Crowden. Kardinal / Diamond Hit / Rubinstein. Owner Craig MacDonald. Bred in Germany. ONLEY GROUNDS EQUESTRIAN CENTRE, RUGBY. Entries now being taken for Warm-Blood and Pony Stallion Grading, also Mare Grading. Entry forms available under relevant heading. Closing date for stallions is 5th October and mares 10th October, please forward your entries ASAP . The Warm-Blood Breeders Stud-Book will be involved in a long weekend of competition at Hartpury College from 7th to 9th August 2015. Firstly having a senior team competing at the WBFSH Young Breeders World Championships to be held Friday and Saturday, with the British Breeders Network Showcase on Sunday 9th August where we will be holding a Mare Grading alongside the show. Times to be confirmed . they can be posted out by calling the Head Office on 01208 832940. The International Young Breeders Championships will for the first time ever be taking place in the UK this summer. Hosted by the British Young Breeders organisation this event, that brings together young horse breeders from stud books around the world, will be taking place at Hartpury College in Gloucestershire over the first weekend in August (August 7-8). The IYB championships are affiliated to the World Breeding Federation for Sport Horses (WBFSH). Teams of four in senior (20-25yrs) and junior (16-19yrs) categories will compete against each other in various disciplines that are related to the breeding of horses. These include assessing conformation, loose jumping and movement, presenting a horse on the triangle to best show its paces and conformation, as well as taking a short theory test. Prizes will be awarded to the stud book that presents the best teams as well as to successful individuals. At the last championships, which were held in Sweden in 2013, the young breeders representing the Holsteiner Verband studbook won the overall team championship. This year four British Stud Books – the Anglo European Studbook, the British Hanoverian Horse Society, Warmblood breeders UK and Sport Horse Breeding (GB) – will each, be putting forward a team for the two-day event. Against them will be teams representing 18 other WBFSH member studbooks including the Hannoverian Verband, the Holsteiner Verband and Dansk Varmblod..
On the Sunday after the championships participants, who will have travelled from Canada as well as Germany, France, Denmark, Austria, Slovenia and Sweden have the opportunity to visit the Festival of British Eventing at Gatcombe Park or stay at Hartpury to spectate at the British Breeders Network (BBN) Showcase – a special event for foals, youngstock and mares aimed at British breeders and producers of sport horses. All in all the weekend promises a unique three days of competition especially for those interested in the breeding of sport horses. Breeders of sport horses and ponies across Great Britain came together for an inaugural meeting in October 2014 to explore the possibilities for collaboration to move the breeding industry forward. Over fifty breeders and studbook representatives met at Moulton College to exchange opinions on the most productive and inclusive way to help the British breeding industry flourish. An illustrative introduction by meeting chair Woodlander Stud’s Lynne Crowden served to set the scene, establish the meeting’s code of conduct, and dispel some the myths around the buoyancy of the breeding industry on the continent and the prices which are realistically being obtained for foals. With a healthy dose of realism and bold examples, Lynne painted a clear picture, leaving no doubt that if breeders wish to get a healthy return on their breeding investment, they need to offer a commitment to thoroughly research, invest in and be realistic in their expectations of their breeding programmes. That said, British breeding has a lot to celebrate and, armed with the facts, delegates were dispatched to break out rooms to debate a number of scenarios. Following this series of active discussion sessions, generous feedback was collated on a series of topics, the bulk of the discussions revolving around industry features and challenges (and how to overcome them) and marketing. Considering the diversity of perspectives of those who took the trouble to attend (and dial in), the convergence of views on many subjects was very encouraging. This meant that there was a good deal or pre existing agreement on the priorities. Under Lynne Crowden’s cohesive chairmanship, the inclusive and self governing British Breeders’ Network (BBN) was formed. The concept of a central discussion group, to be facilitated on an interim basis by Buckingham vet Jane Nixon and linking to a network of enthusiastic regional caretakers was actively supported by the meeting. The next steps have been to coordinate a series of agreed and prioritised actions and form groups of people with expertise in specific areas (such as communications, marketing and legal) so that the agreed actions can be moved ahead. The actions were: create the regional network with a central hub, create a group identity and communications mechanism, create a horse brand identity encapsulating the quality of the horses bred and produced in this country and choose a look and feel for that brand. The horse brand is to be supported by a programme of sales and marketing activity once market information has given more precise direction as to what the target audiences want. Moving ahead, the network will focus on building (or drawing together) a structure for a sustainable breeding, assessment, production, competition and sales environment. The network will take the first steps towards raising industry standards, growing international brand awareness and continuing to progress the breeding of top quality British bred horses which are desirable for riders and trainers in every discipline. Our judges this year, Hans Heinrich Bruening and Katy Holder-Vale were presented with stallions of great quality in movement and type and as a result, we are delighted to announce that the majority of the presented stallions have been graded. The Champion Stallion for 2014 is Heaven (Hotline x Londonderry x Benz) a 2 year old bred by Lynne Crowden and owned by Sara Lucas. Heaven, out of St Pr Limoncello was described by the judges as elegant, refining, of modern type with 3 good paces and was granted premium status. The Reserve Champion, bred by Syzanne Lavandra was her DiMaggio 3 year old Keystone Delino. Out of a mare that Suzanne also bred by Walentino, the judges were particularly impressed by his powerful movement and athletic paces and he also was granted premium status. Summertime Blues, another 2 year old bred and owned by Lynne Crowden and previously licensed into the Hanoverian Stud Book showed some tension in his performance on the day but was nevertheless able to demonstrate all the qualities necessary for him to be approved for our Studbook. The third stallion presented by Woodlander Stud was Freddie M - a 3 year old bred by Lynne and G Eilberg, and owned by Bruce Matthews and Lynne Crowden. 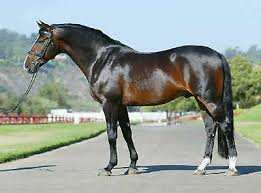 By For Compliment out of Dornroschen (DiMaggio x Caprimond) a half brother to Farouche, this well muscled stallion was described as having lots of power and strength and a horse that makes a big impression. The second stallion presented by Suzanne Lavandra, Keystone Fllamenco, a 3 year old bred in Germany by Furstenball out of a Weltmeyer / Royal Dance Mother has also been graded. The judges described him as a very elegant, impressive, handsome stallion with 3 good paces. Johanne Dykes presented her own Brennus B, an 8 year old Kwpn stallion bred in Holland and already licensed with the AES. By Diamond Hit out of a Rubinstein / Vincent mare he is currently competing at PSG and was described by the judges as charming, well produced and having a good attitude to his work. The final stallion presented was Romanno Rafiel, a 7 year old owned by Brian Hurst and bred by Jennifer Gilchrist at the Romanno Stud. By Rubin Star N out of a St Pr De Niro / Manstein mare this big, impressive stallion coped well and also showed a good attitude towards his work. We thank our judges very much for their time and pass on our huge congratulations to all breeders, owners and producers of the above stallions. Approximate times are below. Please note that it is the responsibility of stallion owners to check the running order and be on time for their presentation.